After the springy weather of the opening day of the 29th Andrea Margutti Trophy, the temperature has been more winterly today and the rain has characterized the qualifying heats of this important event organized by Parma Motorsport at the South Garda Karting circuit. Despite the rain made the tarmac quite tricky, all the races have been highly spectacular and a lot of drivers came to the fore to try and secure the best starting places for the final stages that will take place on Sunday March 11th. All the races will be available through live streaming at www.trofeomargutti.com and www.southgardakarting.it from local 10.40. KZ2. After the best performances put in by Giacomo Pollini (Formula K-Tm-Vega), Massimo Dante (Maranello-TRm-Vega) and Simone Cunati (Top Kart-Parilla-Vega) in qualifying of KZ2, the German Alexander Schmitz (Tony Kart-Vortex-Vega) took three wins in the heats on Saturday, while Fabian Federer (CRG-Tm-Vega) claimed one win as did Massimo Dante. The closing heat went to an unbeatable Alessio Lorandi (Parolin-Tm-Vega). The Swede vice-Champion of International Super Cup CIK-FIA Benjamin Tornqvist (CRG-Tm-Vega) was among the protagonists, but was penalized after the victory in the first heat, while Pollini lost a few places, as did Cunati. The classification after heats: 1. Schmitz; 2. Tornqvist; 3. Federer; 4. Dante; 5. Stell; 6. Lorandi; 7. Giardelli; 8. Tubben; 9. Pelizzari; 10. Pollini. OK. In OK, the first of the two heats went to Andrea Rosso (CRG-Tm-Vega), who had also been quick in qualifying and secured P4. Poleman Hugo Sasse (KR-Parilla-Vega) had to settle for the seventh place instead. The other German Luca Maish (KR-Parilla-Vega) was also among the front runners, he was in fact second in qualifying and also in the first heat leading the Swiss Leandro Anderruti (Tony Kart-Vortex-Vega). Andrea Rosso had to start the second heat from the last place of the grid due to a problem to the spark plug at the start. Rosso recovered then up to P4, while the race was won (after a technical stop) by Leandro Anderruti, with Luca Maish second again leading the British Fin Kenneally (Parolin-Tm-Vega). The classification after the heats: 1. Rosso; 2. Anderruti; 3. Maish; 4. Hansen; 5. Zug; 6. Kenneally; 7. Kocacs; 8. Troger; 9. Schulte; 10. Cuman. OK-JUNIOR. The first heat of OK-Junior saw the Brazilian Gabriel Bortoleto (CRG-Tm-Vega) confirming his role of protagonist. He had secured in fact the pole position and dominated the first race leading team mates Alfio Spina and Enzo Trulli. The second heat was won by the Dane Peterson Hojgaard (Kosmic-Vortex-Vega), while Spina was second again and Luca Bosco (KR-Tm-Vega) third. The third heat was dominated by Gabriel Bortoleto and Enzo Trulli, respectively first and second at the flag, while the German Nico Hantke (Tony Kart-Parilla-Vega) was third. The classification after heats: 1. Bortoleto; 2. Hojgaard; 3. Spina; 4. Trulli; 5. Hankte; 6. Bosco; 7. Villa; 8. Putyatin; 9. Andrade; 10. Doerr. 60 MINI. The British poleman of 60 Mini Coskun Irfan confirmed his momentum taking three wins in the heats on Parolin-Tm-Vega run by Baby Race. His fellow countryman Arvid Lindblad won two races also on Parolin-Tm-Vega but run by team Driver Racing. Cristian Bertuca (Evokart-Tm-Vega) claimed one win too. La classifica dopo le manches: 1. Irfan; 2. Lindblad; 3. Elkin; 4. Bergstrom; 5. Bertuca; 6. Megna; 7. Blum; 8. Krapin; 9. Lupifieri; 10. Iancu. IAME X30 SENIOR. X30 Senior’s poleman Danny Carenini claimed two wins in as many heats. Carenini led Leonardo Caglioni and the brothers Andrea and Marco Moretti, all on Tony Kart-Iame-Komet in the first heat. In the second, Carenini won from Marco Moretti, while his brother Andrea was third. The classfiication after heats: 1. Carenini; 2. Moretti M.; 3. Moretti A.; 4. Caglioni; 5. Palego; 6. Russo; 7. Sperati; 8. Maccari; 9. SaAvarani; 10. Vanzetto. On Sunday March 11th, second change races, Prefinals and Finals with live streaming feed at www.trofeomargutti.com. Sunday March 11th: Warm-up from 8.30 to 10.24; Second chance race OK-Junior, 60 Mini, KZ2 at 10.40; Prefinals at 11.40; OK Final at 14.20; OK-Junior Final at 14.50; 60 Mini Final at 15.20; KZ2 Final at 15.50, X30 Senior Final at 16.20. Prize ceremony for the top 5 of each category at 17.30. 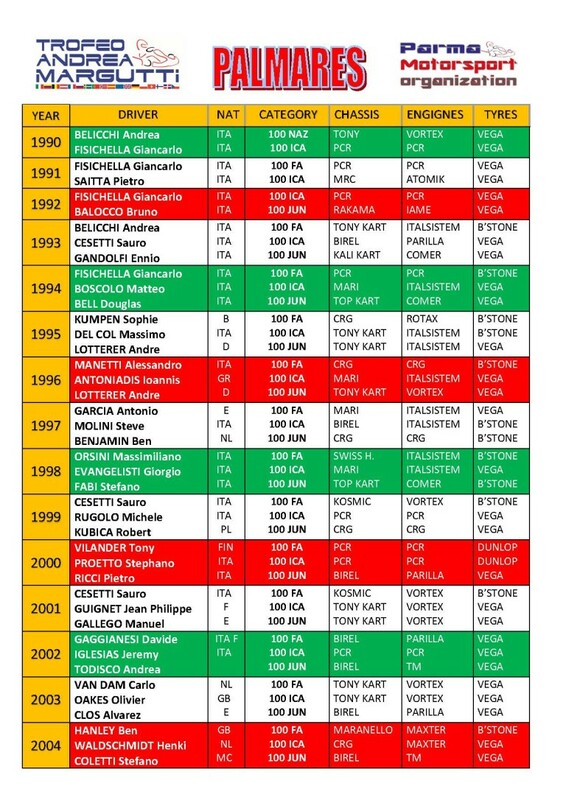 All results, Live Timing an Live Streaming at www.trofeomargutti.com.